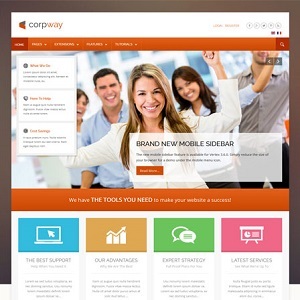 Corpway is the best theme for any business or corporation! Easily match your company's color scheme by setting your own custom highlight color, which will change buttons, menu items, titles and more to any color you wish! This month we have also introduced sample pages such as: About Us, Our Services, Sample Blog, and more; to make site setup quick and easy! We're happy to announce several new features to Vertex. The first new feature is a second layout option for mobile device navigation. The new layout option combines the search, menu, login, register and two module positions into a nicely organized sidebar. We've also built in new custom 404 error page functionality that provides full navigation and seamless integration with the template. Be sure to check out the demo to see it all in action on our demo!